Medieval Morsels: World Cup is on.Time for a Beer. What's so peculiar? World Cup is on.Time for a Beer. What's so peculiar? I was making a steak and ale pie, so I needed some dark ale with great taste to "inform" the stock. I chose Theakeston's "Old Peculier". Then I got absorbed , as I hoped the ale would be in the pie, in looking at the emblem on the bottle's neck and reading about it. A peculier bottle of beer devoid of contents! Could this be the Archbishop of York? Explained on the bottleneck, Theakston's most famous beer takes its name from the seal of the Peculier Court of Masham which was granted back in the 12th century. "It was the custom at the time for the church to administer the law, and this proved too arduous a task for the then Archbishop, who was based in York. So with due archiepiscopal aplomb, he set up the independent Peculier Court, headed up by the Peculier of Masham." Theakston's by contrast was established in 1827 not in the 1200's. This particular "Legendary Strong Ale" is 5.6% proof and is made from barley and wheat. 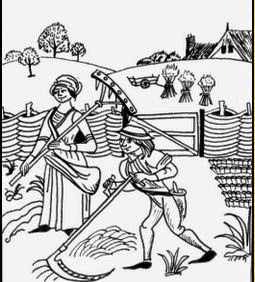 Now, from earliest Medieval times cereal was needed for bread-making and to feed the animal stock that worked the land - oxen and horses later.The demand for cereals was immense in proportion to the population, because insufficient land was under cultivation. So it was fortunate that a huge new granary opened up, also in the 12th century, when Germany expanded onto the plains of Eastern Europe. Beer drinkers should pay attention from this point. So plentiful and cheap were supplies of cereal from the Baltic that, courtesy of the well organised Hanseatic League traders plying their trade across the North Sea, there was now grain enough to spare in England - even for brewing!! Fermented barley, known as malt was an essential ingredient. A weak, unfiltered and cloudy "small ale" was home brewed, often by women of the household. Drunk by all classes of medieval society, and their children, it provided some nourishment. Because water is boiled as part of the process, ale was a safer drink than water itself. Its alcoholic content would also discourage micro-organisms to some extent, although ale did rapidly go sour. Strong ale was no doubt brewed for medieval festivities, or for consumpion in alehouses. What is the difference between ale - drunk in one form or another from the earliest times across many civilisations - and beer I hear you ask!? Its a historical difference now rather lost in the move to modern beer production. Ales were made long before hops first reached England's shores in 1524. The beer making process practised in continental Europe used hops, which imparted a bitter taste that balanced the sweet malted barley. Ale drinking habits continued throughout England into Elizabethan times after 1524, when hops and beer making began to gain some ground in London. According to Anne Wilson’s book “Food and Drink in Britain” by Elizabeth I reign (1558 - 1603) even ale came to be lightly hopped, helping it keep better. Hops, now grown locally to London were no longer an expensive imported item from the Low Countries (Belgium and Holland). Annette Hope in her book “Londoners’ Larder notes that both ale and beer could be made very strong “..and London ale houses, where the ‘ale-knights’ sat all day, drinking until they fell off their stools, were a byword.” A byword for excess! MedievalMorsels makes a range of one inch dolls house miniature foods from Medieval and Tudor times- flatbreads that used barley as an ingredient in varying proportions with rye and other grains. It also produces dainty barley bannocks that would grace a rich guildsman's dining table! Herring in disguise -kipper or bloater?